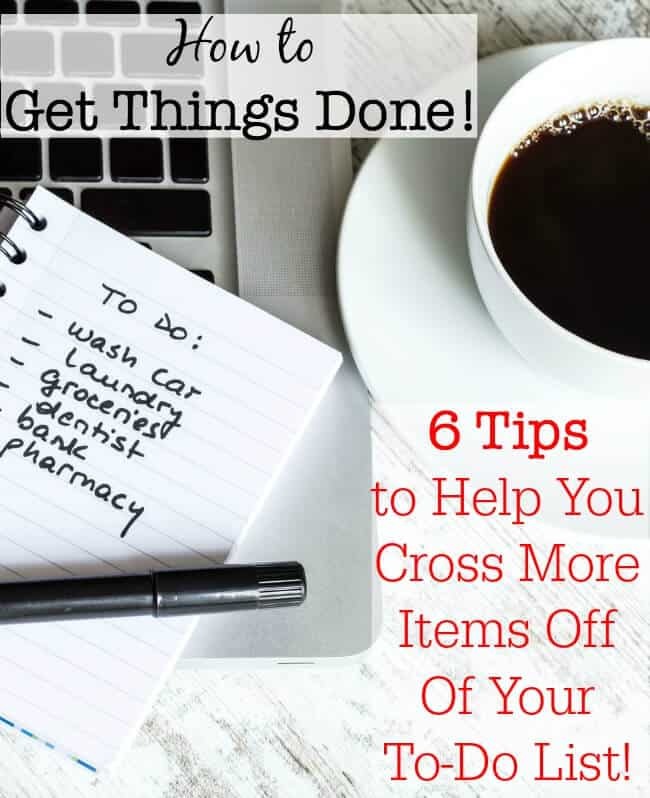 How to Get Things Done: 6 Tips to Help You Cross More Items Off Of Your To-Do List! Do you ever wonder where all the hours in your day go? You know that you have worked and worked all day long never even stopping to sit down, but when the end of the day arrives do you look back and wonder where all of the time went and why you feel that you have nothing to show for it? Well it's time to get organized and spend some time focusing on how to get things done! There are definitely things we can all do to improve our personal productivity– whether we are trying to run a home-based business or just run a household full of kids! And it starts with being mindful about how we spend our time and planning our day out intentionally. Here are my 6 best tips to show you How to Get Things Done! 1. Give yourself credit and cut yourself some slack! We clean up the breakfast dishes, start a load of laundry, bathe the dog, put away the 5000 lego pieces left on the kids' bedroom floor, fold the laundry, check email- all before 11 am. Yet, that doesn't feel like we really got anything done, does it? That was just “cleaning up”, right? And then we glance over to that long list of things that we need to do, and we sigh and wonder “How did it get to be 11 am already, and I've done nothing on this list?” Well, it's certainly not like we were sitting around on the couch watching TV and eating bonbons! So your first step is to acknowledge that you do a heck of a lot more than you ever give yourself credit for- because you tackle dozens of things each day that never even make onto a to-do list! Secondly, you need to cut yourself some slack… ESPECIALLY if your kids are young and not in school yet! Trying to care for your family when your children are young is definitely a full-time job in itself- regardless of whether or not you also work outside or inside of the home for financial compensation. And there is just not a lot of “extra time” to tackle projects and things you feel “you should be doing”. Give yourself the same kindness you would give a friend who was feeling overwhelmed and frustrated and strip your to-do list down to its bare bones! We allow ourselves to lose track of time when working on the computer- reading blogs, checking Facebook, seeing what's going on in Twitter-land. One post/ status update/ tweet leads to another and another. Or sometimes it is watching a Netflix series- you are so sucked in that you try to squeeze in “just one more show”. And then suddenly we look up and realize an hour or two has gone by and feel guilty about it and panicked about what we didn't accomplish during that time. The problem here is NOT that we spent time on social media or watching Netflix- the problem is that we didn't approach it intentionally. We didn't create some time in our schedule to do these things, and then stick within the time we set aside for that online / TV time- and that is what creates the guilt and frustration for “not getting things done”. Even though I am up and moving before 6 am every day, that time is taken up by getting myself and all 6 kids ready, fed breakfast, and sent on our way for the day. And my afternoons are dedicated to family time. So when it comes to time I can dedicate to “getting things done”, most of it needs to happen between 9 am and 3 pm. I imagine that your day isn't exactly wide open either! So the first thing to do is to figure out all of the open times during the day that you have available to “do stuff”. You can print a blank copy of this time blocking worksheet for your own use- just sign up below to join our MomOf6 community! There aren't very many open slots during the day, are there? That's why I find it so challenging to “get things done”! 5. Realize that there is no “perfect week” when all of these time frames will truly be available to you! You'll have a doctor's appointment for you, the kids, or the dog. You'll want to get your hair cut. A child will stay home sick from school or there will be a teacher's conference day. It is safe to say that no week will actually look like the above example! But then here's the reality… in order to take care of these other things- stuff needs to come off of your list! Maybe the laundry just has to pile up until the next laundry day. Maybe you don't get time for your hobby or to work on the to-do list. Think of the schedule as the best possible scenario- and then prepare to be flexible! And then make adjustments to where you felt you didn't give yourself enough time, and decide what needs to come off of your list. Looking for the best family calendars, planners, to-do lists, and goal setting tools? Here are some great ideas on how to organize your home! Do you feel that scheduling your time mindfully and with intention would help you to accomplish more of the things that you want to do? « When was the last time you spoke with your kids about drugs? So nice to get to a stage where imperfection is just perfect. I am planning to sit down to get myself organized next week after a very hectic summer. Sorry about the late notice, but I have chosen this post as one of my featured faves from last week’s Thursday Favorite Things. I will be featuring you on my site this week! Thanks so much Shellie! I too am trying to get myself re-organized for post-summer life! These are great tips. I have three different calendars- my phone, my day planner, and our family calendar in the kitchen. That way, I can always look and see what I have going on. If I don’t have it written, I won’t remember it. I’m visiting from the Best of Blogosphere link up. Doesn’t all of that re-writing make you crazy- or at least worried that you’ll forget to record something somewhere? This is really great advice, and thank you so much for starting with your #1! 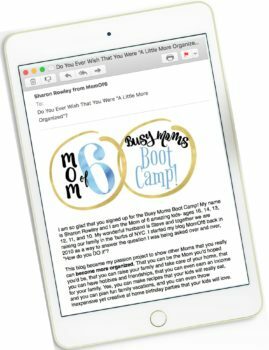 I really need that reminder since I am home with a 1 and 3 year old, trying to blog, trying to run a business from home, and more! #2 is spot on too! I waste too many precious moments on social media. I still do too! (#2) It’s a constant battle! I am attracted to this post because I am always looking for ways to be more organized. And I agree that crossing off an item on my list is so wonderful! These are some wonderful tips to keep in mind. I love the idea of creating a spreadsheet of your schedule so you can physically see what you’re doing when. Thank you for sharing this with us on the #HomeMattersParty. We hope to see you again next week when we open our doors at 12 AM EST on Friday. Social media is a big one for me also. I like that you say try it for a week and then make adjustments. Great advice! Social media gets me every time! What starts out as 15 minutes on Pinterest can easily turn into an hour. Great tips! I find there are days and seasons when I manage to get lots done and other times when it feels like I get nothing done. These are some great tips! Thanks for sharing at our Tips & Tricks Link Party! I think the social media thing is a big one for me! I am always on a device!